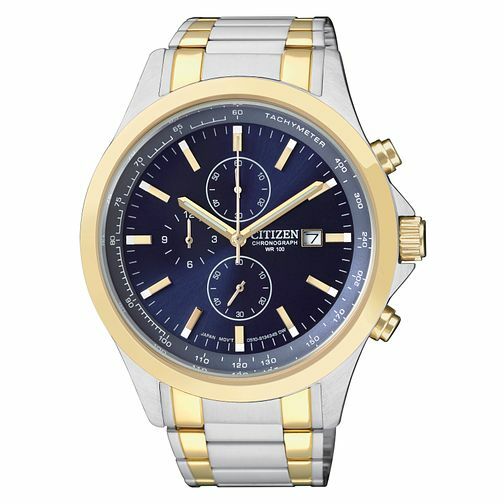 An elegant, sports inspired men's chronograph timepiece by Citizen. Crafted with a stainless steel and gold-plated bracelet and case, date window, tachymeter and 100 metres water resistance. Citizen Men's Two Colour Bracelet Watch is rated 5.0 out of 5 by 2. Rated 5 out of 5 by Anonymous from Fantastic Watch Bought this watch for our sons 21st and he was over the moon with it. Rated 5 out of 5 by Anonymous from Great looking watch This was a present from my wife and I love it, great design, classic looks and a really good solid build quality. This is my first Citizen watch and it certainly wont be my last either.